(Oct. 16, 2018) -- To further enhance the student experience and foster student retention and success, UTSA today announced an ambitious new student housing plan for the Main Campus and additional retail, dining and housing spaces on the Main and Downtown Campuses to support the university’s growing student population. UTSA will expand its on-campus living experience with two new residence halls. One will allow hundreds more students, particularly incoming freshmen, to live on campus. Additionally, a Residential Honors College will be built to support the specific needs of the university’s honors students. The proposed four-story, 360-bed residence hall dedicated to freshmen will include study lounges, community lounges, community kitchens, laundry rooms, group study areas, a multipurpose/seminar room and a coffee shop. Located at the intersection of Tobin and Brenan Avenues on the UTSA Main Campus, the new residence hall will provide convenient access to the Roadrunner Café and many more on-campus housing amenities and support services. Construction of the residence hall is expected to begin next fall. Students are expected to move into the 95,000 gross-square-foot structure at the start of the Fall 2021 semester. The Residential Honors College is the first step in UTSA’s efforts to align its Honors College with the top-reviewed honors colleges in the nation. The new facility will provide a dedicated building for honors students to live, learn and collaborate. In addition to student residence rooms, it will include connected classrooms, study rooms, a maker space, dining and fitness facilities, and event space. A Residential Honors College Task Force will work with university stakeholders to determine how the new residence hall will impact the growth and size of the UTSA Honors College. It will then make recommendations for its location and design, based on student needs. As UTSA prepares to grow to 45,000 students by 2028, it is also making plans to enhance the campus experience through the construction of a vibrant new neighborhood called Roadrunner Village that will benefit the campus community and surrounding neighborhoods. Located along UTSA Blvd. between Ximenes Ave. and Bauerle Rd. on 20 acres owned by the university, this urban village will offer a mix of market rate housing, retail, casual dining, a grocery store and entertainment venues. Once the first phase is complete, Roadrunner Village will provide an additional 1,000 to 1,500 beds for faculty, staff and upper-class students. In addition to bringing a much-needed sense of urban walkability to the edge of Main Campus, Roadrunner Village will provide affordable housing to accommodate a growing student population as well as amenities to serve students living in off-campus complexes along UTSA Blvd. The Village’s proximity to the academic core will offer convenience and connectivity for the students, faculty and staff living within its residences. Roadrunner Village will be developed through a public-private partnership. UTSA will enter into a long-term cooperative arrangement with a private developer to finance, build and manage the facilities. As with all university building projects, care will be taken to ensure the project aligns closely with the UTSA Campus Master Plan initiative. 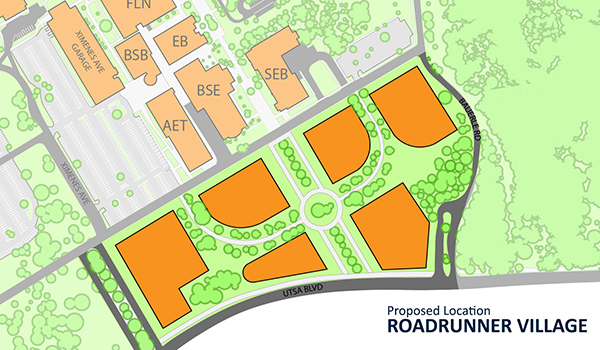 The timeline for the development of Roadrunner Village is still being determined, dependent on the terms of UTSA’s agreement with a developer. The goal is to begin construction as soon as fall 2019. Integral to the 10-year vision for the Downtown Campus, UTSA is also making plans for a new housing option to enhance student and faculty engagement and bring vibrancy to the near Westside of San Antonio. A new mixed-use residential facility called Cattleman’s Square Residential Tower will stand on the northeast corner of the Downtown Campus’ current footprint. The public-private partnership will feature two floors of street-level retail, restaurants and services, two floors of underground parking, 10-15 floors of student housing and academic and maker spaces to facilitate experiential learning, entrepreneurship and student success. UTSA also plans to issue a request for qualifications (RFQ) next month for development of its Cattleman’s Square property.